This is an absolutely gorgeous lasagna to serve to family or even company. The golden browned cheese and the delicious aroma is mouthwatering to those waiting for the first taste. The rich, creamy, tasty blend of three distinct cheeses is a heavenly marriage of flavor. 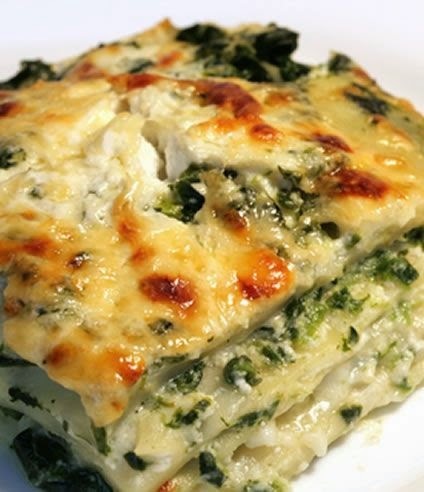 Beautiful, bright, nutrient-rich spinach tucked away in the layers of pasta and cheese is superb. It is a meal that will have everyone begging for more.. Prepare a 13 x 9 x 2 lasagna pan by spraying lightly with olive oil. Set the pan aside until ready to use. Gently blend the ricotta and parmesan cheeses together, adding salt and pepper. Now spread 1 cup of pasta sauce in the lasagna pan. Spread 1¼ cups of ricotta mixture on top of noodles in a light layer. about ⅓ of the spinach mixture on top of the ricotta mixture in spoonfuls. Repeat the layers ending with 3 lasagna noodlesand the remaining sauce. Using aluminum foil cover the lasagna and bake for about 30 minutes. Then remove the foil and sprinkle the grated Gouda or Swiss cheese on top. (If using slices, lay slices on top of lasagna to cover). Bake uncovered for an additional 15 minutes.. Cheese should be golden brown. Remove from oven and let stand for about 12-15 minutes before serving. 0 Response to "Creamy Perfection Vegetarian Lasagna with Ricotta Cheese"